Everything starts with Clarity. What does the report contain and how can it help me? Get a report that is unique to you. This will create a whole new agenda in your life for making the changes you need, being clear about what you need to do, and enjoying the confidence that certainty will bring. Section 1 – What does the report contain about me that is so valuable? This report on YOU contains everything you could want to know about how you come across such as your communication style, your strengths and limitations, strengths you may overuse, how proactive you are, how you would manage other people and much more. Section 2 – Why is that so important? The Clarity and Certainty Report works for everybody, regardless of age, status, the sector you work in, it’s all there for you. Everybody needs to be clear about how they see themselves and how others see them. This allows you to reflect on any changes you might like to make, and work as an agenda for personal development. Section 3 – What will it do for my career? The better you understand yourself, the clearer you will be about which company culture is right for you, and what sort of management style will get the best out of you. Improved Self Awareness can invariably lead intuitively to taking corrective action where necessary, and a better understanding of how you are motivated. If you work or are considering working in sales, what is your sales style likely to be? It compares this to your perception of the ideal sales style for the role, giving invaluable insight to give you a successful sales career. Many roles have an element of selling in them, as companies get more and more focused on sales growth. Some people find that daunting or have no idea how they will come across. This report will give you invaluable insight into that. You may have a team of people that report directly to you, or perhaps are applying for a job which has managerial responsibilities. Understanding your leadership style and how you come across to others is vital to develop an effective way to get the best out of your people. Section 4 – What specific information does the report contain? Section 5 – Why is knowing my behavioural style important? Your behaviour is the outward, external manifestation of YOU. It’s what people see, and it’s what encourages them to draw conclusions about you. You may not be realising the signals you give off, so it’s about time you did! Your behaviour affects dramatically how you come across to other people, things like your communication style, how you would engage with others, how systematic you are, and so on. It can dramatically affect how successful you are in a role by identifying if you are the right cultural fit. It can affect how your boss sees you, and of the relationship you will have. It can affect how your customers see you, and how you deal with them. It can affect how your team see you, if you are in a leadership role. In short, all interaction with people will be decided by your behavioural style. The clearer you are about it, the more you can do to influence it. Section 6 – What areas does my behaviour cover? RISK is the tendency to take risks to achieve objectives. EXTROVERSION is interacting with people in favourable environment. If you’re low, you will be rather closed and isolated. If you’re high, you will be persuasive and like being the centre of attention. Of course, these are the extremes. For many people they will fall somewhere between the two. So where do you fall, and how might your behaviour be described? Section 7 – How do I express my emotions? If behaviour is the external demonstration of you, emotions are what is going on inside you that sometimes come spilling out. Who do you know with a short fuse? Who do you know who gets stressed out easily? Or who is the poker player that never gives anything away how they’re feeling? The Clarity and Certainty report has a facet it measures called S – for self-control. It measures how much control you have over your emotions. It is the ability to self-discipline, foresight and a social sense of responsibility. Low self-control can often mean you can be impulsive, but also highly spontaneous! High rigid control can come across as highly rational and sometimes hugely demanding. Again, most people are somewhere between the two, so what would that mean in the way you express yourself? Section 8 – Am I devoting enough energy to my role? This can be a real eye-opener for many people, and can lead to a lot of positive change. This refers to both the Energy levels, i.e. the mental and physical effort you are putting in to your role. But also the Energy Balance, which is am I responding with energy levels above or below the job requirement? Also, how decisive am I being? Section 9 – How Pro-active am I? There is a lot of talk these days about how important taking initiatives and making things happen is in any particular role. This report can guide you about currently just how proactive you are, both in Tasks and dealing with People. From your behaviour we can tell you what the implications are for how you will deal with these important criteria. Understanding whether this is task or people-related can create a clear agenda for development. Where are you in Dominant or Proactive? You will find yourself with unrivalled insight into how you come across. As part of a separate report, but FREE with your Clarity and Certainty report, this report looks at the implications for your business competencies, and ranks you whether you will find each competency, easy or whether it’s something you have to work hard at. Examples of the competencies looked at include, Self Confidence, People management, Pursuit of Information and Planning. It provides an invaluable context for objective observation and development. 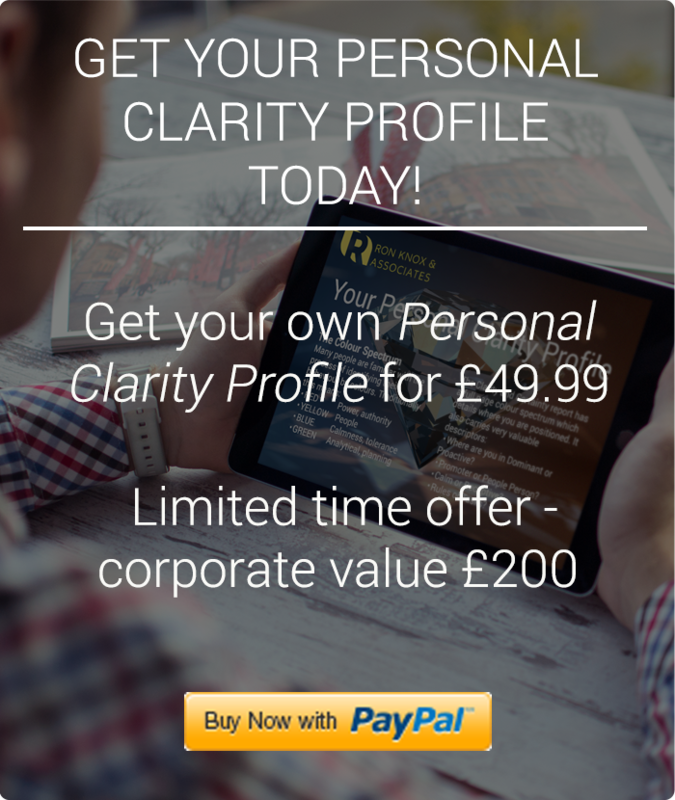 Purchase your Personal Clarity Profile today! You will receive a link which you click to go into a behaviour questionnaire which takes only 10 minutes to complete. You will receive your 24-page report plus 5-page competency report immediately by email. You are one click away from a brighter, clearer, more certain future. Previous Entry How can Clarity Certainty help on an ongoing basis? Next Entry How do I understand myself better?